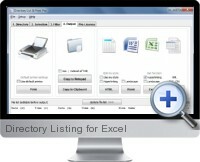 Excel Directory Listing examines specified directory paths to create listing of directory and files information in a simple structure. The directory listing results can be exported to Excel and a variety of other formats for further analysis and integration. Directory listing recursion identifies and lists all child directories and files in a tree structure. Metadata of files listed can also be extracted to enable filtering and sorting of results in the final output. Multiple approaches to launching the listing process include drag and drop from Windows Explorer, context menu option from Windows Explorer and explicit directory selection. Unlimited sub-directory levels and files are looped and extracted with recursion. Optional recursion depth can also be set. Listing extracts metadata including name, size, extension, file count, creation and modification dates. Title text within document content is supported for PDF, Word and Excel files. Extended metadata for media files is supported including dimensions, duration, format and bitrate. Supports both connecting and disconnecting network drives. Extracts file attributes such as Read Only, Hidden and System file types. Calculates CRC32 checksums for files. File and directory dates support all international data formats. Filtering and sorting allows to sort by, exclude or include files and directories by criteria for any of the extracted attributes in the listing. Output options include printing, Word, Excel, HTML, CSV, Text, XML or saving to the clipboard.